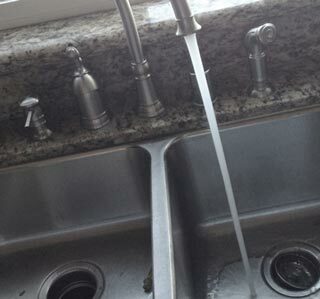 You are here: AABC Plumbing >> Why Does My Kitchen Sink Smell? If there is a bad smell in a kitchen, it is hard to mask it. You can light candles and use odor killing air sprays, but those are just temporary fixes. In many cases, the foul smell is strong enough to cut through the sprays, oils, and candles. The only way to get fresh air in your kitchen is to fix the smell at its source. Kitchen sinks can breakdown and malfunction, and some of the problems result in a terrible smell that permeates throughout the house. If you wish to clean up the air you and your family are breathing, please give a call to a Manhattan plumber. We can help you solve your kitchen smell problem. There are two common reasons why a kitchen sink will begin to smell, and we can help you fix both problems. Even with a food trap, it is hard for individuals to keep their drains completely clear of food particles. Over time this food can get stuck and caught in portions of the drain piping, and eventually this food will begin to rot and decay. The smell of the food will come back up through the sink drain and will fill the kitchen and adjoining rooms. If the problem is not a result of food, the smell is coming from a gas leak. Gas leaks happen in the sink trap or the plumbing vent. There can be a few reasons why gas is leaking from this area, so it is best to give us a call to figure out why and to then fix it. Call us sooner than later so that you can avoid calling an emergency plumber in NYC.